Which of the following best illustrates Newton's Second Law? By this principle, if there is zero acceleration, then the force must also be zero. A non-zero acceleration must be present if there is a non-zero net force. Which of the following is the best example of Newton's Third Law? Newton's Third Law states that for every action there is an equal and opposite reaction. In other words, a force will act in equal and opposite directions on the two objects involved. Weight and normal force are a specific example of this principle. Acceleration due to gravity creates a downward force, known as weight. 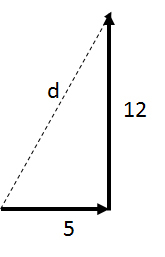 This force, however, results in zero downward acceleration when the object is resting on a surface (a book does not fall through a table, for example). For the forces to be in equilibrium, there must be a counteracting upward force. This is known as the normal force, which is equal and opposite to the weight of the object. While weight pulls the object down, normal force pushes it up to create equilibrium. University of Florida, Current Undergrad Student, Mathematics and Statistics.